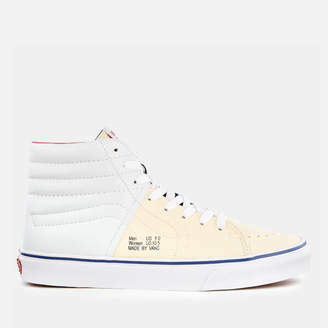 Vans lace-up hi-tops crafted from durable canvas and faux leather with printed text to create an inside out appearance. The 'Sk8-Hi' trainers feature a rounded toe, a lace fastening and a padded ankle collar to ensure comfortable wear. Designed with the brand's iconic sidestripe and tonal stitching throughout. The sneakers feature perforated detailing to the vamp. Set on a vulcanised rubber sole with the characteristic waffle tread and an 'Off the Wall' licence plate on the heel. Upper: Textile/Synthetic. Sole: Rubber.